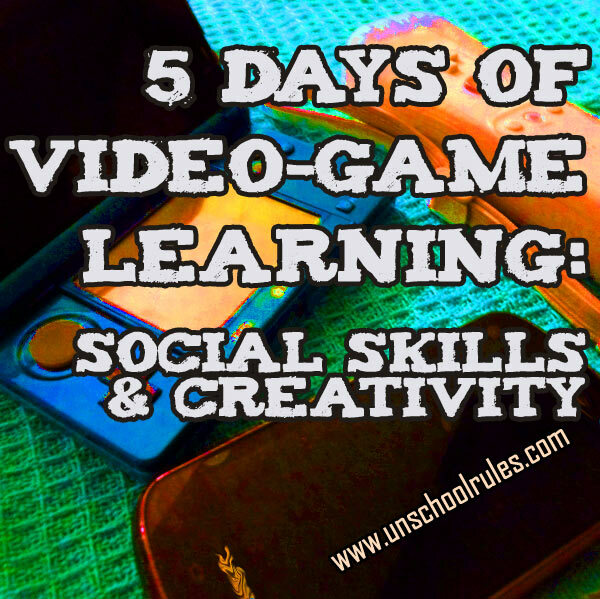 Today, we’re talking about how some of our favorite video games have helped Sarah develop her social skills – and her creativity. Maybe these two topics aren’t the first two you’d group together. They weren’t for me – until I started making two separate lists and realized that they overlapped ENTIRELY. The interesting thing is, these are two areas we were told that many kids with Asperger’s (like Sarah) struggle with – social skills, and playing creatively. And at times, I see it. But other times, I don’t – like when Sarah shows me the way she “saved a tree” in Minecraft by putting walls around it, or writes nice notes for her virtual Moshi Monsters friends. And that, to me, is so much of why we value video games as a tool in our learning arsenal – because they are great ways to show off the best parts of Sarah! Minecraft – I could write a book on this, Sarah’s new favorite game, which basically involves placing various material blocks to “craft” or make things. She has the Pocket edition for her phone, and we’re planning to buy the PC edition next week. The two operate similarly, but there’s one big difference – you can play the PC one with friends on a server, and the Pocket one is all individual. Sarah’s favorite thing to do is build in “creative” mode, where you just get unlimited materials and do virtual construction. In “survivor” mode, there are bad guys to avoid, and you have to work for the materials, so she only does that if she’s really feeling up for a challenge! She and her friends frequently share YouTube videos of how to build different things, and it’s been great to watch Sarah figuring out how to use various materials to make the things she wants! (And to see her and a friend at 4H this week excitedly saying, “Did you see the alien I made? Did you see the castle?”) The alien, by the way, is what’s pictured here. He’s crafted from a tree! Moshi Monsters – This was one of the earliest web-based games Sarah started playing, and she still spends a lot of time on it. (It’s not just web-based; there are Moshi-themed Nintendo DS games as well, and possibly some for other platforms!) You have a monster. He plays mini-games, you can decorate his house, and you can make friends with other people’s monsters. Sounds simple, but amazingly, it’s home of a TON of amazing games inside, including one we’ll talk about later in this week’s series that’s – gasp – math-themed. The coolest thing here is how Sarah has friends who she gets together and plays with, while doing things like “creating” or “growing” Mooshlings, which are little pets for the monsters. Webkinz – Another web-based game based on actual stuffed animals that come with codes to unlock their virtual counterparts. At last count, Sarah had almost 50 of them, and it’s been amazing to see her build the virtual world that they live in! She then gets out old shoeboxes and things and makes them “real-life” rooms to match, which is super-neat! Much like with Moshi Monsters, in addition to the creative play, this game has a lot of actual educational mini-games inside it! Art Academy 3DS – This is on Sarah’s “wish list,” and she can’t wait to get it. It is a full drawing tutorial inside a 3DS game! We’ve been playing the demo version in the store and we can’t wait until we get the real thing. Camera and sound recorder on 3DS – Yet another unexpected win for creativity: Sarah, who has a digital camera, loves the camera on her 3DS because she can then edit the pictures right on screen. You can even add sound and make them look 3D! She also likes recording sounds – like our dog barking – and editing them. She’s found out that speeding it up makes him sound like a little dog, and slowing it down… well, our dog can’t possibly sound any bigger, but she got the idea that if he COULD, he would with the sound slow! I feel like our story with social and creative gaming is just beginning, despite all these favorites. I think it’s something that kids of any age can appreciate, but the older Sarah gets, the more she’s really digging into and embracing the idea of virtually hanging out with her friends – creating worlds full of stuff they love and challenging each other to be even more creative! This entry is about arts and crafts, music, social skills, unschooling, video games. The previous post was All my kids want to do is play video games – and that’s not bad. The next post is Digital currency: Video games for math. This is a very cool series. I am enjoying it. My girls have lots of access to tech time and I love learning about new apps and programs for them to discover. Minecraft is huge in our house. My girls started with the free version and just bought the Mac paid version. It is their favorite thing to do together. Looking forward to your recommendations for math! Keilee isn’t interested in Minecraft. Of course that is subject to change from one day to the next. About a year ago she started playing Eden on the iPad and would just get lost in there for hours. 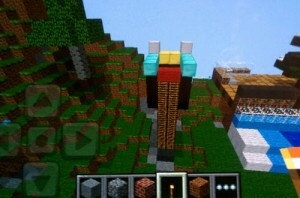 It is very similar to Minecraft. She has played Webkinz since she was 6 and has over 140 of them. She had a character on World of Warcraft when she was 5. 😉 She has played tons of online games. She plays Wii but not often. It is in spurts. I think it is because I have always spent time on the computer playing various games and such. I am so enjoying this and can’t wait to read more. Webkinz is probably the longest-running favorite of ours! Sarah just absolutely loves it. She “only” has about 50 but I think that’s a lot!